Lady Portia is the Goddess of Justice and Opportunity, representing these qualities to the Earth. Her action is that of balance, and harmony to hold that balance. She is one of the members of the Karmic Board, representing the Violet Ray. Twin Flame and Divine Complement of Saint Germain, this being focuses with the Violet Fire to bring forth justice, freedom, mercy, forgiveness and alchemizing effect. You can call upon this Lady Portia and her sacred fire for the qualities of Freedom, Justice and Opportunity to act in your life and the world. She also lends assistance in legal action. Scales of balance are her symbol as well as the Maltese Cross. 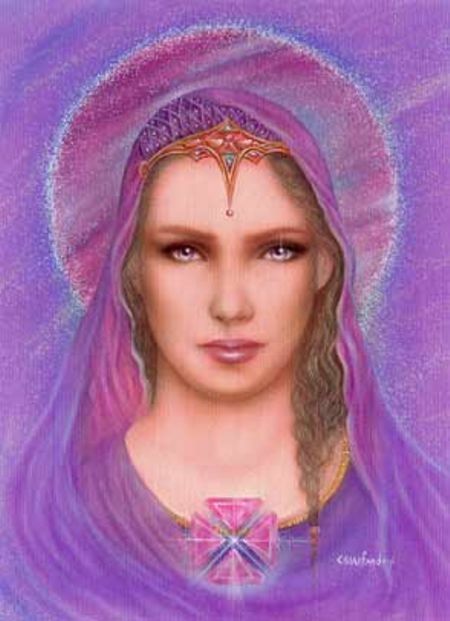 Lady Master Portia, Goddess of Justice and Opportunity, and twin flame of Saint Germain, maintain a retreat over Ghana, near Accra, that expands the violet flame of Freedom and God-Justice. The Freedom and Justice Arch in Accra is an outer focus of this retreat. Portia invites students to come to her retreat to master the four elements and the balance between thought and feeling, masculine and feminine, justice and mercy. (personal prayer) Beloved Portia, help me to remember upon awakening all that will help me to fulfill my mission on earth and the mission of my twin flame. I accept this call manifested through the power of the Christ and am thankful for its realization. In the name of the Father, the Son, the Holy Spirit and the Divine Mother, Amen. I have listened to every interview, but this one meant so very much to me personally. Lady Portia was talking directly to me! She provided wonderful advice & reminded to remember! Take the time to be still. ASK! All the masters are always there to assist us! Remember to find BALANCE in our lives. Thank you for this inspiring message. It has lifted my spirits like a month of Sundays in the church house!